Republic Pictures Home Video In the 1970s, The Streets of San Francisco was the City's signature TV series much in the manner that most Americans became familiar with Honolulu because of Hawaii Five-O. Streets, an ABC crime drama, was filmed entirely on location here, from the waterfront to the Sunset, including stake-outs at real addresses as well as regular use of the City's neighborhoods and, as the title suggests, streets. From 1972-1977, police detective Mike Stone (Karl Maldin, left) busted bad guys alongside his partners, Steve Keller (Michael Douglas, right, 1972-1976) and Dan Robbins (Richard Hatch, not pictured, 1976-1977.) Stone was the veteran cop, Keller and Robbins both rookies. In the enjoyable and well made series, Keller and the others used their wits to catch pimps, drug dealers, murderers, bank robbers and more, all without the benefit of a talking car, haute couture, or high tech gadgets. Because well-known and obscure City locations in The Streets of San Francisco are far too many to enumerate, Mister SF has chosen a token few. 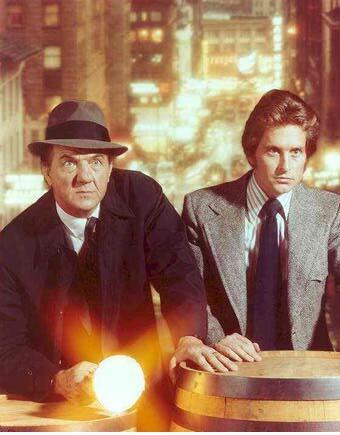 When Martin Sheen robs a bank at California and Kearny in 1973 in Episode #28, "Betrayed," he makes his getaway by the alley, Spring Street. Keller lives at 289 Union Street near Montgomery. Mister SF leaves no stone unturned to bring you previously undocumented SF cinema locations. Stone stays with daughter Jeannie at 768 De Haro Street in Episode #41, "Committment" from 1974. Winn's character, Barbara Talmadge, shoots a cop in front of 393 Marina Blvd. in "Most Feared in the Jungle" after her captor runs the light in front of 485 Marina Blvd. and is pulled over at the intersection where the boulevard meets Casa Way and Avila Street in front of the Marina Green. Tom Bosley drops in on his ex, Sheree North, at 818 Church Street and later stalks their child at Dolores Park in Episode #31, "Going Home." Alcatraz is the setting for the climax of "Going Home." On November 11, 2004, Douglas presented Maldin with the Eugene O'Neill Theatre Center's Monte Cristo Award for Maldin's lifetime of stage work. Earlier the same year, Douglas was on hand to present the 92 year-old actor with a lifetime achievement award on behalf of the Screen Actors Guild.